One of the things that almost everyone deals with in life is stress. In our culture where people are over worked and alway on the run there is little time to do anything else. We are a culture that lives on the edge and burns the candle at both ends. What we need is Margin. Margin by definition is the amount that is available after what is necessary. Meaning that what ever you have left (time, money, resources) after you have done what is necessary in your life then that is you Margin. The problem that most people have is that they have no margin. They are so consumed in what they are doing that they have used up the margin in there life. But how do we get Margin in our lives. The first thing is that we have to Schedule Margin. Craig Groschel says “We must learn to say no to good things so that we can say yes to better things”. There are a lot of good things that we do that eat up our time and keep us away from things that are better. Working is a good thing but alway staying and working late keeps us from our family which is a better thing. There are times that we have to say no so that we can say yes to something better. When people ask you to do something you can say no, I can’t. We are all given the same amount of time in a day and it is how we use that time that help us or hurts us. We can not try and do everything. Somethings are just not worth doing. The second thing that we need to learn to do is create financial margin in our life. We have to come to realize that we do not want to be NORMAL. Because normal is living paycheck to paycheck. Normal is have three or more credit cards max out. Normal is living in a house that you can afford and driving a car that you don’t need. Our culture has become a culture that defines happiness and success on what you have. In the book the “Millionare Next Door” there was a study done that found that the people living in the biggest house were not necessarily wealthy. They had a lot of stuff but little to know wealth because they were so far in debt. They found the wealthiest people were those living in nice but not over the top homes but they were out of debt and had wealth. Our culture is a instant gratification, society that believes that appearance is more important than reality. What this has done is created a Marginless life where people have no room for era and they have all this stuff but they are living pay check to pay check under pressure all the time. This leads to problems in marriages, problems with children feeling neglected. Why would we want to live like this? Wouldn’t life be better if we had more time to relax, to enjoy life. If we had a smaller house with a smaller mortgage or maybe even no mortgage but had the money and time to go on vacation with the family and really enjoy it. Financial margin is possible but it requires changing ones lifestyle in order to achieve it. People who create Margin in their life are happy content people that are not living stressed out all the time. Maybe you should consider creating margin in your life. 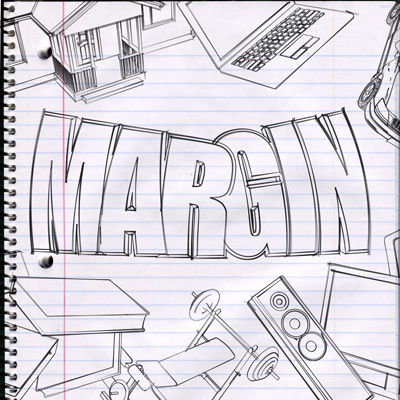 Margin was a Life Group lesson that we taught. You can check the series out on the Podcast page. If you would like a copy of the series, simply email us at questions@southdecaturchurch.com and let us know what you want and we will send you a copy of the series.